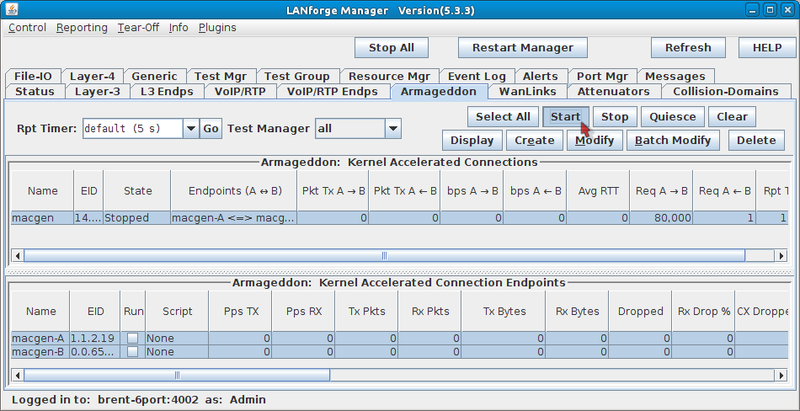 Armageddon UDP Traffic Generation with Random MAC Addresses. Goal: Generate network traffic to a network device with one or many destination MAC addresses. A one-sided traffic stream is used to send packets to a network device under test when round-trip reporting is not required. On the Armageddon tab, click Create. The connection name for this example is macgen. Src MAC: 00:01:00:00:00:00. This is the starting point for emulated remote MAC addresses. Dest MAC: 00:0e:fa:12:bc:3a. Use the destination MAC address of your system under test. Max Src IP: 10.26.254.254. This emulates about 65,000 remote hosts. Max Dst IP: 10.27.254.254. This emulates about 65,000 destination addresses. Pps Tx: 80,000. This is a 1Gbps packet rate. Src MAC Cnt: 65,025. This emulates 65,025 remote devices. Select UnManaged. This allows us to fire and forget the packets. Click OK to commit the configuration. Src MAC: 00:01:00:00:00:00. 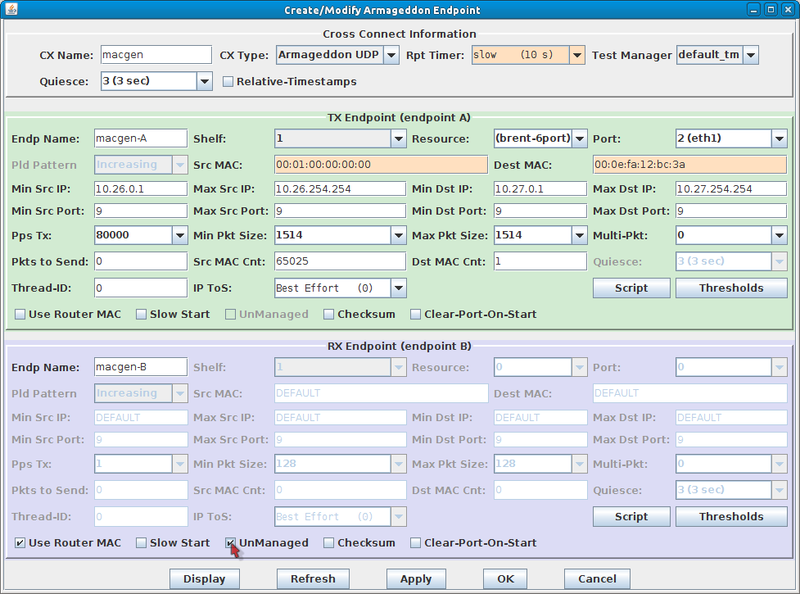 This is the starting point for emulated source MAC addresses. Dest MAC: 00:02:00:00:00:00. This is the starting point for emulated destination MAC addresses. This address is 4.2 billion addresses after the starting source MAC address. Src MAC Cnt: 65,025. This emulates 65,025 source devices. Dst MAC Cnt: 65,025. This emulates 65,025 destination devices. In the Armageddon tab, click the Start button. Traffic will begin.